For the ninth consecutive year, OLYMPIACOS and his leader, Mr. Evangelos Marinakis, visited the ELPIDA Association and supported the effort of Ms. Marianna V. Vardinoyiannis, for the children’s sake! A visit that has become a tradition. A cooperation that has become a landmark. A limitless and unconfined offering. Mr. Evangelos Marinakis, OLYMPIACOS, the “ELPIDA” Association, Ms. Marianna V. Vardinoyiannis. An encounter centered on the offering towards the children that struggle for their lives, every single day, the children who win. This visit was dedicated to these children, who, as Mr. Marinakis himself said, “are the real winners in life!”! Around noon on Monday, January 21st, as he traditionally does for 9 years now, the Legend of Greek football left aside his competitive obligations and revealed his social facet. Headed by the leader of OLYMPIACOS, Mr. Evangelos Marinakis, the whole team was present in the "ELPIDA" Association, on the children’s side! Present were the honorary president Mr. Savvas Theodoridis, the Mayor of Piraeus Mr. Giannis Moralis, the second Vice-President and CEO Mr. Dimitris Agrafiotis, the Director of the Commercial Department Ms. Penny Laga, the Communications Director and Head of Club Operations Mr. Kostas Karapapas, the CSR Director Mr. Domenikos Masoulas, Ms. Irini Daifa, while Mr. Christian Karembeu was also, naturally, accompanying the team. Olympiacos’ players were present and offered many smiles to the small children, who welcomed them as heroes! The first to take the floor was the Chief Administrator of the Children's Hospital P. & A. Kyriakou and Aghia Sophia, Mr. Manolis Papasavvas, who warmly thanked Mr. Marinakis, OLYMPIACOS, but also, naturally, the ELPIDA Association for everything they do for the children: “Mr. Marinakis, Mr. Mayor, Honourable Members of Olympiacos’ team, let us welcome you to our hospital. For the 9th consecutive year you are here with us. This shows your active support and your love towards the work we do in our hospital, and we thank you warmly for it. Let me tell you that recently our hospital has started being a center of excellence. Already the bone marrow transplant group has earned the highest certification in its field. This certificate classifies it as one of the leading bone marrow transplantation units, and two weeks ago, there was the first cell therapy done in our country, on a 40 year old woman who had acute leukemia and had a bone marrow transplant about one year ago. She contracted a cytomegalovirus, a CMV infection that could not be treated by medication. This was what happened, thanks to the great donation made by ELPIDA and Ms. Vardinoyiannis: our hospital acquired the first cell-processing machine in our country. This way, we got cells from the donor, which got to the hospital, there was the proper treatment at our center, then these cells were given back to the patient, and they were able to face the infection that exists. This happens for the first time in our country. Ms. Vardinoyiannis, we thank you for giving our medical and nursing staff the chance to be always ready and at the cutting edge of medical technology and science. Also, special thanks to our hospital’s medical and nursing staff. Mr. President, once again thank you”, he stated. Mr. Marinakis and our team were welcomed by Ms. Marianna V. Vardinoyiannis herself, who didn’t hide her joy, watching the Legend’s presence, next to "ELPIDA", for the ninth consecutive time. “One thing that you must keep in mind is that 4 out of 4 children will get well. This is due to everyone’s effort. On this, I want to express my gratitude to all of you. This hospital has such a family atmosphere... A child was crying at the exit, saying he didn’t want to leave and how he wanted to stay here forever... Here we don’t provide the children only medical treatment, we also offer them psychological support and our love. Mr. President, Mr. Mayor, Mr. Theodoridis, my dear friend Irini (note: Ms. Irini Daifa), my dear children, all the members of OLYMPIACOS that are here today... OLYMPIACOS' visit to our hospital has become a tradition, because, at the beginning of each year, not only we, the elders, but also the children, we’re all eagerly waiting for your arrival. As you can see, never before have so many children come as today, to admire their heroes. Even little Christos, who was sitting in my arms just a moment ago, was saying he is an Olympiacos fan for 4.5 years now, because he's a little older than that. He assured he will always be an Olympiacos fan. This is really very important, because today’s the ninth year we have you with us and we welcome Mr. Evangelos Marinakis, our personal friend, and Mr. Moralis, Ms. Irini Daifa, and the whole team with great joy and all the players whom the children watch and who are known to all of us. For nine years now Olympiacos is on our side. We have the OLYMPIACOS Star placed on the wall, to remind us forever of this love that connects the family of ELPIDA with Olympiacos. Mr. Marinakis has become himself a volunteer donor. Also, Mr. Marinakis has been declared honorary member of the "Vision of HOPE" (Orama ELPIDAS) a few years ago. Over the last few years, every time the President of Olympiacos, Mr. Marinakis, comes, he makes silent and discreet donations that help us bring new machines and improve the children's health. Each year they bring gifts for our children. He has offered the children free tickets for the stadium. Among the offerings were also many jerseys, which hang framed in various parts of the hospital so as the children can admire them. On March 30, 2015 a plaque was placed in the "Vision of HOPE" space, in recognition of OLYMPIACOS’ support for the volunteer bone marrow donor bank. Also, the President of Olympiacos, Mr. Marinakis, has been awarded the honorary plaque of ELPIDA, as well as, on January 4, 2016, the statue of ELPIDA. On March 5, 2017, Mr. Marinakis was given the plaque of the "Vision of HOPE". On January 11, 2018, OLYMPIACOS became a "Champion for HOPE”. All this happened during this period, and I had to read it because it’s so much… I thank the President and all the members of OLYMPIACOS for all they have done for us. We would like to express our gratitude by offering the President an honorary plaque for his substantial and priceless offer to our children”, said Ms. Vardinoyiannis. Touched, Mr. Evangelos Marinakis took the floor, after being honoured and having given Ms. Vardinoyiannis one more check to reinforce the work done by this huge institution. He addressed the attendees, explaining the real reason why he and OLYMPIACOS always stand by the effort of ELPIDA for the children. These children, who are in fact heroes, who are the real winners in life! «First of all, I’m happy to be here along with the entire team, for the 9th consecutive year. For us, as Mrs. Vardinoyiannis said, this has become part of our Olympiacos "family" tradition, being here with these children. We’re also very happy to see that every year there’s a continuous progress in here and that many children are being saved. And not only they are saved but they have been integrated in society without any problem. And, of course, all this has happened due to the passion and the continuous will of Mrs. Vardinoyiannis, who thrives to improve the whole organization year after year. Furthermore, having seen the categories “Artists of ELPIDA (Hope)”, “Champions of ELPIDA”, we have to state as OLYMPIACOS, that from the very start what we have tried to implement with this tradition, is that Olympiacos is a winner! 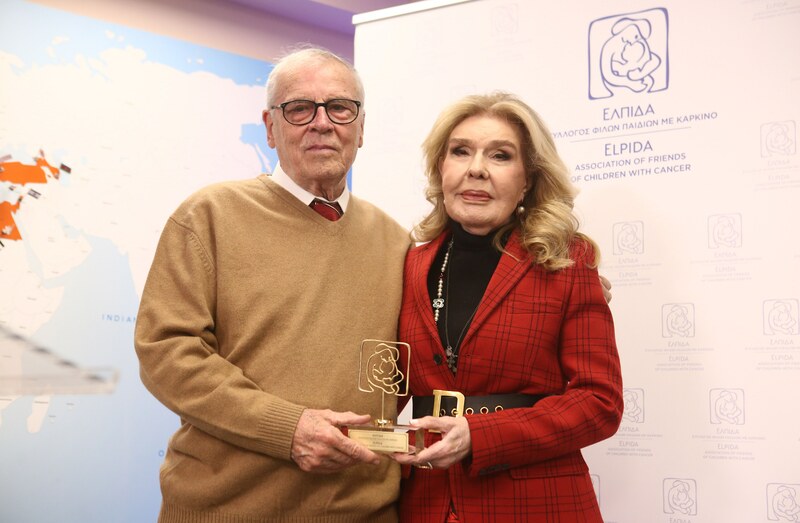 This is what we are also doing with the Municipality of Piraeus and with the “Piraeus Winner”, and thus we suggest having a category in ELPIDA, the “ELPIDA Winner”, since all these children and their families are winners in life! Thank you very much and I would like to thank you once more for what you do for the Greek society and for all of us. I wish you all the best, health and happiness for 2019!», declared on the occasion Mr. Evangelos Marinakis! Ms. Irini Daifa then took the floor. She had also been honoured, as she keeps, according to her own words, close ties with both “ELPIDA”, OLYMPIACOS and the Municipality of Piraeus! “I wish the best for our team. I wish to say that I’m very proud and privileged because I’m connected with all three institutions. I’m one of the founding members of "ELPIDA", a fact that is very important to me and I’m always saying that our dear Marianna shows us the way. The second is that I’m in the Municipality of Piraeus for 5 years now. I’m also very proud of this and, of course, I have many ties with OLYMPIACOS, a great love for the team. OLYMPIACOS is a very important part of my life. I'm a very lucky person because I'm connected with all three institutions. Thank you very much and I wish you a good year!”, she declared. Ms. Vardinoyiannis honoured Mr. Theodoridis, Mr. Moralis, Mr. Karembeu, and also all the team of Olympiacos, with the ELPIDA souvenir, while the coach of the Legend, Mr. Pedro Martins, speaking to the representatives of the press, analysed the multiple benefits of the ELPIDA’s social work, as well as OLYMPIACOS’ social offer: “This is a great proof that Olympiacos is not just a football club. He is a supporter of life that supports people, supports all people in need. He’s here today to give strength, hope and a voice to those who are in need. I’m impressed by the oncology unit's work. I’m very impressed with everything that’s happening here. With the facilities and with what I've seen. With how very useful all this is so as to help children in need. From what I’ve learned, the results are very positive and I’m very excited that there are such units that improve the lives of the people who need it. Olympiacos is always here, is always on the side of such units and such institutions that need him and we are here to visit the real heroes of life, all the people in need. We are always on their side. Olympiacos is an institution that always supports such initiatives and situations of this kind, wherever it’s needed. We are present, we are here to give strength and joy to these heroes in order for them to overcome their problems and the situations they are in. We will always be on their side and we are very proud that, as Olympiacos, we are here for this reason” stated the coach of the Legend. OLYMPIACOS' players, Mr. Martins, the coaching staff and Mr. Karembeu visited the children in their chambers, distributed many gifts and smiles, taking love and returning it! The psychological support of the children and their families, which suffer every day, is a huge cause. OLYMPIACOS is always present and will continue to be. The instructions of Mr. Marinakis, his great will and desire, are that these winners of life enjoy the support of the largest multi-faceted organization of Greece, OLYMPIACOS, and continue fighting! Because THESE children and their families are the real heroes of this life! They are the real WINNERS!